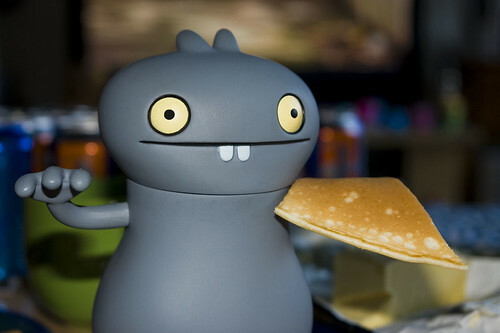 Uglyworld #187 - Babo Rescues Some Pancakes, originally uploaded by www.bazpics.com. You all know how Babo works, the phrase "Babo's got your back" is well known now - well today Babo proved that once again he REALLY does have the other uglies back. After Wage had scoffed over half of the massive plate of pancakes he made he sat back on the couch and started to play the xbox360 again (he keeps going on about getting to level 23, then level 26 and I belive he's on level 29 now), the little uglies all had rumbling bellies as they hadn't eaten yet, little Babo Jr asked Wage for a pancake or two to share between them, Wage snapped "No, get your own, they're all mine". Babo Jr ran straight to big Babo who said that he would sort it out. Babo grabbed the controller out of Wage's hands to screams of "I'm going to crash, give me iiiiiiit baaaaaaaack", Babo stood perfectly still and said "You won't get the controller back until you share the pancakes with everyone, understood". Wage muttered a stifled "ok, take them" under his breath, after which Babo grabbed some pancakes and passed them around all the other uglies, and only after doing this gave Wage back his controller.